Visitors to Myrtle Beach find a variety of outstanding entertainment options to choose from. Superstar celebrities, dazzling dance shows, spectacular music/variety shows, action packed dinner shows, world champion ice skating, and more combine to offer something for everyone. Alabama Theatre - “One” The Show! The East Coast’s most spectacular musical extravaganza! Winner of the Governor’s Tourism Event of the Year and South Carolina Venue of the Year. The Celebrity Concert Series highlights many big names throughout the year. Calvin Gilmore Presents: The Carolina Opry - The Carolina Opry is the Myrtle Beach area's longest running show and the South's #1 attended show. Since its inception, The Carolina Opry and Calvin Gilmore have won every major South Carolina tourism award including The Governor's Cup, the state's highest tourism award. The show has also been voted The State's Most Outstanding Attraction and Calvin Gilmore has been designated the state's official Country Music Ambassador by the Governor of South Carolina. If you only see one show while you’re in Myrtle Beach, make it The Carolina Opry, the only show voted best year after year! Another great show brought to us by Gilmore Entertainment is Good Vibrations! Which features the best music of the 60's, 70's & 80's blended with special effects & elaborate costuming. This fast-paced, high energy show takes you back to the decades that brought us the best in American Popular Music. Pirates Voyage - Located on the site previously occupied by Dolly Parton's Dixie Stampede, Pirates Voyage is a fun-filled attraction featuring a buccaneer battle and a pirate feast. Legends in Concert - The world's longest running tribute show! Legends in Concert is a full-scale production featuring the greatest collection of celebrity impersonators ever assembled performing live in concert recreating the look and sound of legendary artists from yesterday and today. Le Grande Cirque - A mesmerizing spectacle of artistry and imagination performed by some of the world’s greatest acrobatic and theatrical performers! This show is guaranteed to leave you spellbound and breathless with amazement and wonder. 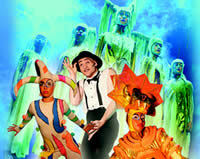 Le Grande Cirque will instantly transform your reality into a world of enchantment and delight! Medieval Times - An action-packed dinner and tournament. "Give them a Knight they'll Remember"
The Palace Theatre - Located at Broadway at the Beach this impressive 63,900 square feet: 1200 seat venue features a series of musicals, theatricals & spectaculars.